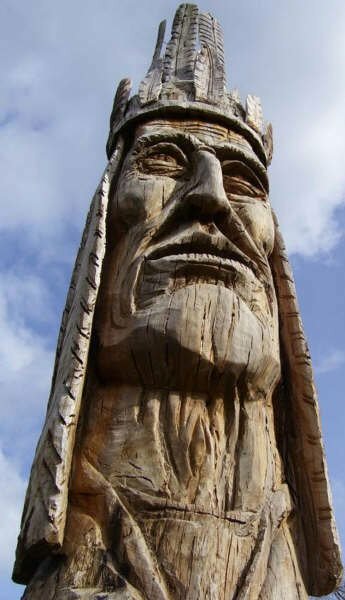 This wooden statue of a Native American chief is a familiar sight for long-time visitors to Charles Towne Landing State Park in the West Ashley area of Charleston. Nestled on the Ashley River, Charles Towne Landing honors the site of the first European settlement in the Carolinas, dating back to 1670. The settlement lasted only a brief time before being moved to Oyster Point in 1680, now known as White Point Garden. 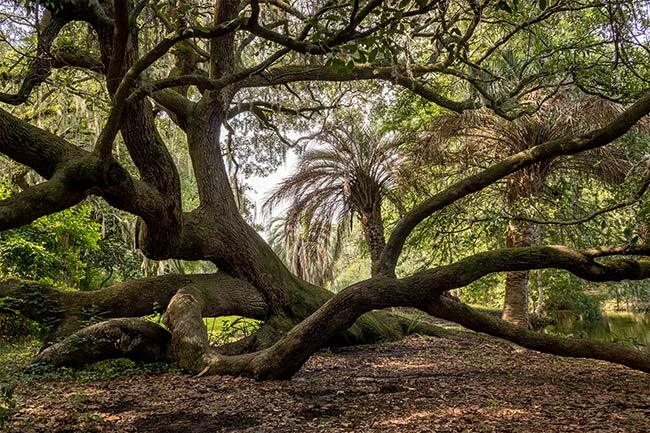 The location was initially chosen as the settlement for European explorers after the Cassique of Kiawah, leader of the Native American tribe which inhabited this area, met with English explorers Captain Robert Sanford and Dr. Henry Woodward. The Cassique persuaded the men to make this land their new home with the promise of cooperation and trade. 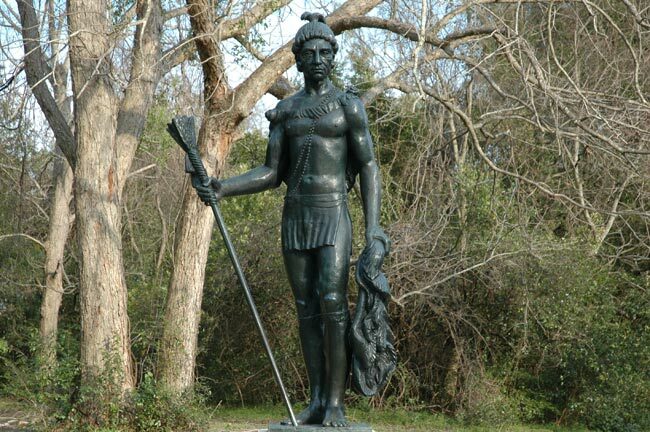 The statue below, created by Charleston sculptor Willard Hirsch, was unveiled in 1971 and commemorates the Kiawah chief. Charles Towne Landing offers many opportunities to learn about the cultural and natural history of the Charleston area. For example, a replica of a seventeenth-century ship called Adventure (shown below) invites visitors aboard to see how settlers shipped trade goods – specifically raw materials such as timber. Also, the Animal Forest is home to many of the same species that greeted settlers upon their arrival, including native bears, pumas, otters, and bison. Interpretive trails allow for spectacular bird watching, and bicycles are available for rent. The park underwent a full renovation and reopened to the public in August 2006. One of its highlights is beautiful Founders Hall, a large, LEED-certified event venue. 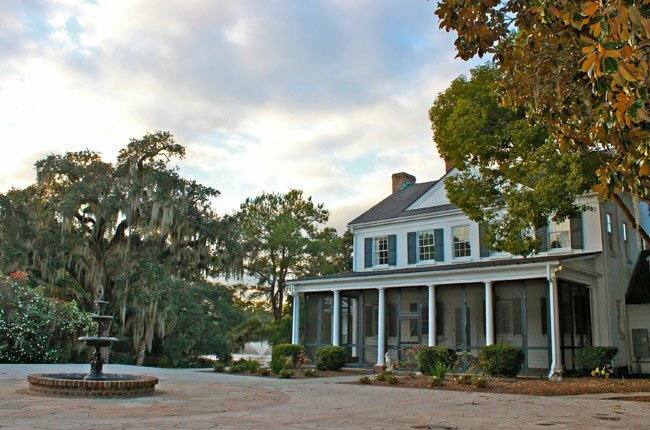 Charles Towne Landing is also home to a former plantation home, the Legare Waring House, which today serves as an event venue as well. Enslaved Barbadians and indentured servants were among those who first landed here. The building shown below is a replica of what would be known as a common house. This common house provided shelter for the indentured and the enslaved after their long days of labor. A museum located inside the Visitor Center preserves artifacts discovered in local archaeological digs, and within the grounds are an historical garden, an African-American cemetery, and a Native American ceremonial site. Dogs on leashes are permitted in the park with the exception of the Animal Forest. 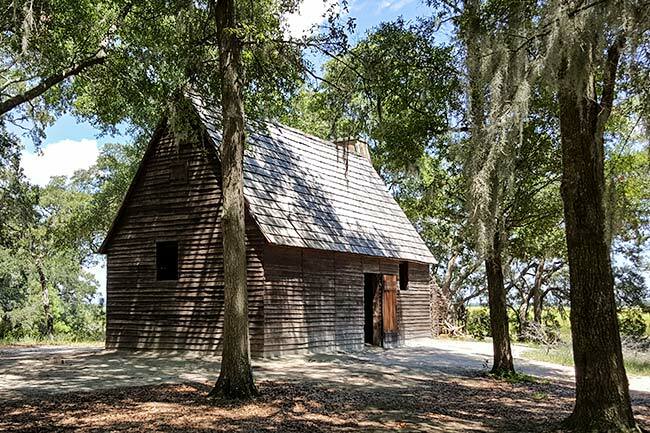 (Charles Towne Landing State Park) The settlement of Carolina was planned as a planting and trading province by the Lords Proprietor, and the success of the venture came about through the efforts of Sir Anthony Ashley Cooper, after a 1664 settlement on the Cape Fear had failed. After a stormy voyage during which the vessels Albemarle and Port Royal were lost, the Carolina anchored off the Carolina coast and the settlers decided to plant at Kayawah. They arrived early in April 1670. This group was joined on May 23 by a sloop, The Three Brothers, that had come by way of Virginia. The settlement was located on the Ashley River in a country known by the Indians as Kayawah, and that is was on a point of land having a river on one side and marsh on the other, known as Albemarle Point. In November 1670, the colonists were informed that the town in which they were settled was to be known as Charles Towne. Threats of a Spanish invasion made the settlers quick to build fortifications. Both a broad trench and a palisade may likely have been used. 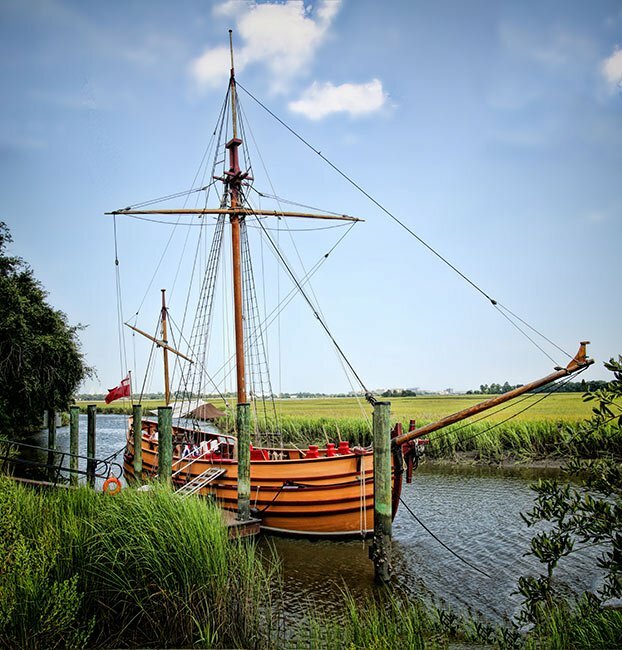 One fun feature of the park is a replica of a 17th-century trading ship floating in the Ashley River. Named The Adventure, the ship was created to showcase a full-sized model of what would have been used to sail the Atlantic Ocean for the purpose of trading goods between the early colonies and the Caribbean. 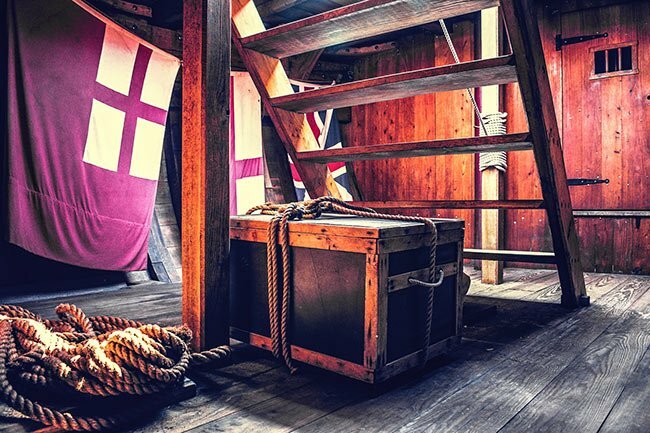 The cabins of the ships were typically small, allowing only enough room for a captain and first mate to share a space. There would have also been a bunk room where other crew members could sleep. 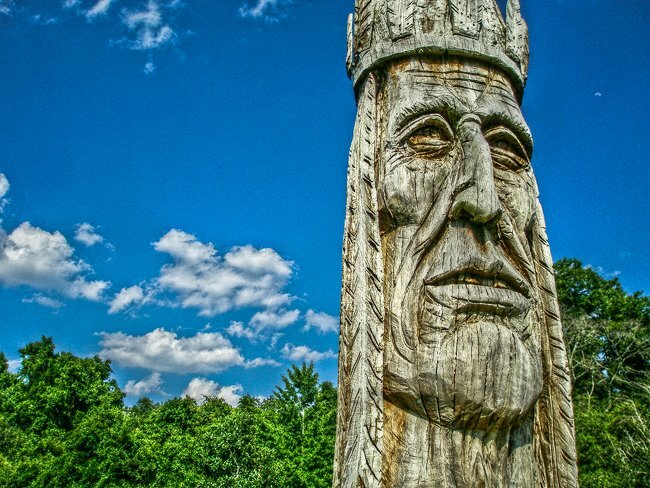 Peter Wolf Toth’s iconic wooden statue, seen below and at the top of the page, stands at 24 feet and is part of the Trail of Whispering Giants series, a collection of 74 wooden statues by Toth honoring Native Americans throughout the United States as well as in Canada. One such statue even stands in Hungary, where Toth was born. The carving was placed here in 1977 and is made from a 500-year-old Darlington oak (Quercus hemisphaerica). I am a volunteer for Walk for Autism-Charleston 2017. We are having our 14th annual walk on April 22nd, 2017 at Historic Hampton Park starting at 9:00am. Walk for autism is a private, non-profit, tax-exempt organization dedicated to meeting the needs of families with children facing life-long disabilities. This walk is organized through the efforts of parents of children with autism. The money raised helps families in the Charleston area to receive educational scholarships that provide intense one on one therapy in the home. If products are donated please include the value so that we can determine the sponsorship level. For more information please feel free to contact me at 843-553-1316 or email: rrzoneal@hotmail.com also visit our web site http://www.walkforautismcharleston.org Thank you for your support. Hi, Carolyn. Thank you for commenting. The link to the Charles Towne Landing website can be found above the map on this page. Hopefully, your questions can be answered there. What are the hours Charleston Landing is open? What is the yearly membership dues? Landing Brave, Peter Wolf Toth Statue # 23. Toth completed his goal of a statue in each of the fifty states in May 1988. http://www.dcschumaker.com/statues.htm Peter Wolf Toth. Statues are listed alphabetically by state.